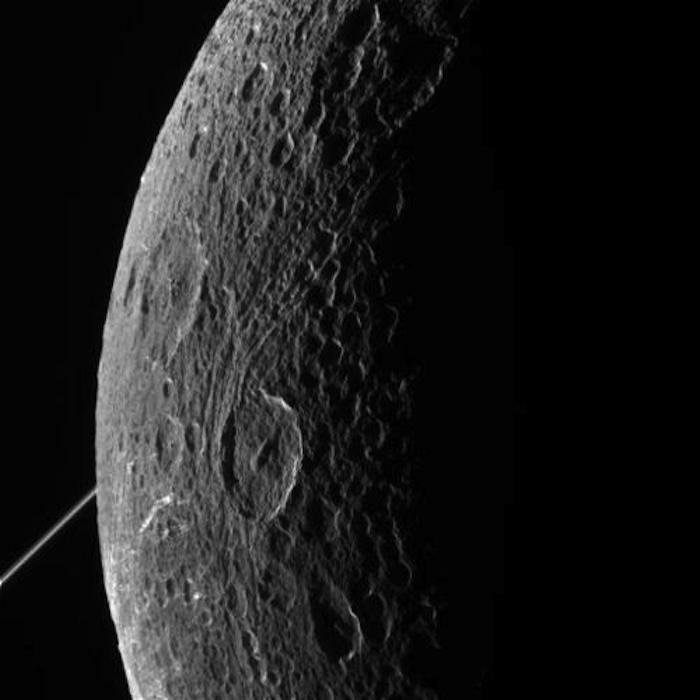 Saturn’s moon Dione received a fleeting visitor this week, when NASA’s Cassini spacecraft whizzed by to image bizarre streaks thought to be canyons with ice walls up to 100 stories tall. The raw images from Cassini’s encounter are flowing back to Earth, and they reveal wispy bands of bright material stretching hundreds of miles across Dione. Scientists believe the strip-like features are fissures created by subsidence of Dione’s surface, with ice-encrusted walls rising hundreds of meters from the canyon floors. 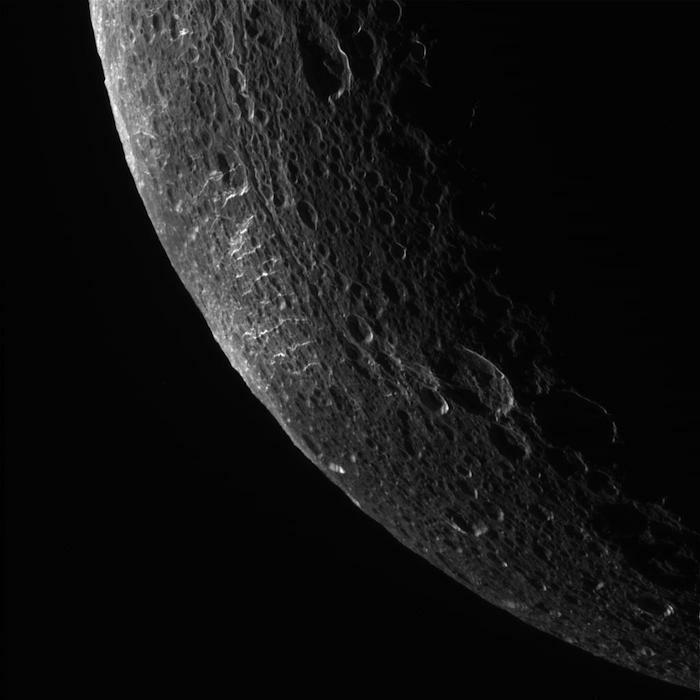 Scientists hoped to detect fine particles which may be lofted into space from Dione’s surface. A positive detection would indicate Dione sustains low-level geologic activity, according to NASA. Other goals of Tuesday’s flyby included measurements of Dione’s gravitational field and observations of the moon’s night side to study how the body loses surface heat. 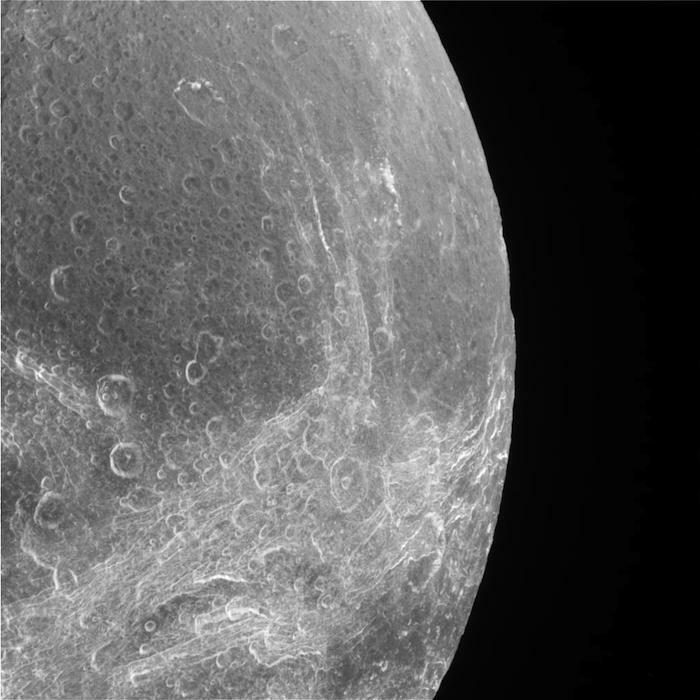 A fifth and final flyby of Dione in August will be Cassini’s final close-up visit to Dione. The mission is making its last flybys of Saturn’s icy moons this year as it heads toward a planned destructive plunge into the giant planet’s atmosphere in September 2017. Cassini made its last flyby of the sponge-like moon Hyperion on May 31, and the orbiter’s last three encounters with the icy moon Enceladus are due before the end of the year. The probe, which arrived at Saturn in 2004, is running low on fuel. Ground controllers will guide Cassini into a new orbit inside Saturn’s rings for the mission’s last hurrah. Cassini’s final visit to Titan, Saturn’s largest moon, is scheduled for late 2016.